Visiting a baby in the NICU every day is just as important to their recovery as the medical care they receive. But many families are unable to afford the transportation costs to make this a possibility, meaning many babies are left alone. The average length of stay for a baby in the NICU is 28 days, but many must remain there for months at a time. Meaning babies are left alone because their parents simply cannot afford to see them. We get parents to their babies and believe this battle shouldn’t be fought alone, or be plagued by additional burdens. Top level NICUs are often located in urban areas with expensive garage parking fees. Lurie Children’s Hospital and Northwestern Prentice Women’s Hospital are located in one of the most expensive neighborhoods in Chicago. For a family to be there all day every day it could cost upwards of $75/day and more than $1,000/month. If these fees seem burdensome to the average family, consider their impact on NICU families who have hospital bills piling up. Lurie Children’s hospital is a level IV NICU, which means they take care of the sickest patients who have extended stays and are fighting for their life. 52% of these families are on Medicaid. Families with babies in the NICU struggle with many burdens – parking expenses shouldn’t be one of them. Jackson Chance Foundation works directly with parking garages to purchase passes in bulk that are otherwise not available to the public. A $300 donation provides one monthly parking pass, that could save a family more than $1,000/month. Learn more about the medical benefit of human contact and how we bring families together. 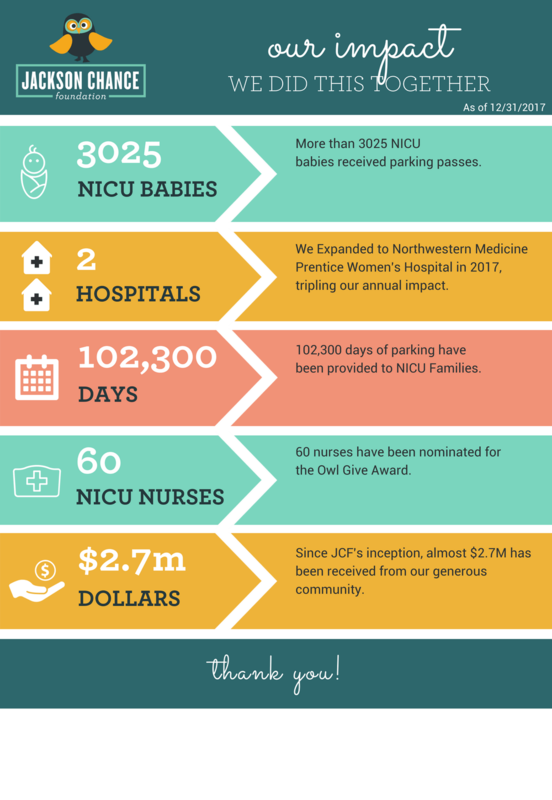 See the impact we’ve had on NICU families since our inception in 2012.
families are in the NICU for months – not days!